Box Dimensions (LxWxH) 2.35 x 1.45 x 1.45"
Pan F Plus Black and White Negative Film (35mm Roll Film, 36 Exposures) is rated 4.8 out of 5 by 49. 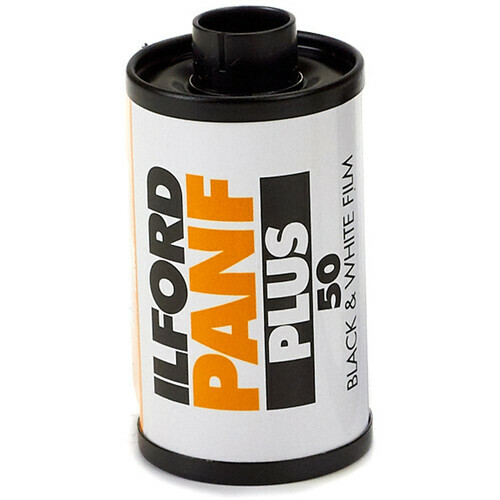 Rated 5 out of 5 by Commando303 from Magnificent Ilford Pan F Plus B&W negative film is simply marvelous. No, it's not for all purpose, but, if pushed, I'd probably claim it as my favorite film. It has about the tiniest grain of any film out there; its contrast -- perhaps a bit high for some -- suits me wonderfully; and it offers unparalleled sharpness. Agfa APX 25 and Kodak Technical Pan are gone, but, fortunately, Pan F + is still hanging around. For more general use, Delta 100 Professional might be a better option, but, if you really crave grand quality, black-and-white film doesn't get any better than this. Rated 5 out of 5 by Your Pal, Adam from Satisfied new user of Pan-F I purchased this film for some specific B&W projects. I find it to be much finer grained, and more detailed than regular B&W. I am pleased with the tone ranges and separation of highlights/shadows/other details. I felt that it was not as forgiving as typical negative film and required exposure calculation to be much more accurate (not as narrow as E-6's, but not as wide as C-41's). Very very happy but don't think I would have a major use to justify cost per roll outside of fine art or perhaps high-quality portfolio work. 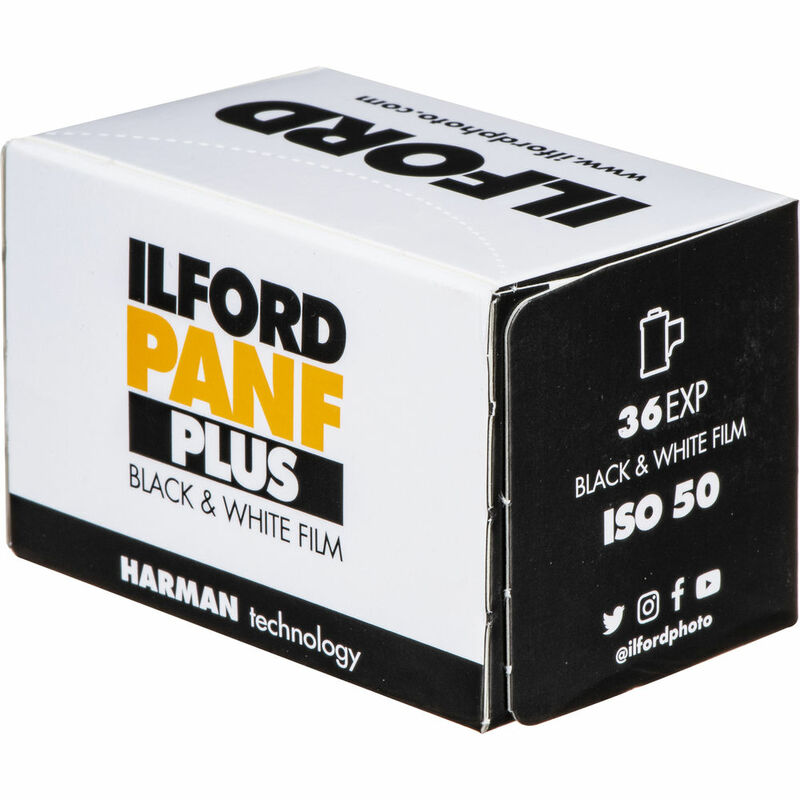 Rated 5 out of 5 by Anonymous from Excellent B & W film This is a fantastic black & white film for those shooting in bright conditions and that want smooth, virtually no grain results. This was my first time shooting anything lower than 100 ISO. Despite the challenges of obtaining enough light for exposure, the results are excellent. Fantastic detail captured with excellent exposure latitude and shadow detail. Highlight detail can become lost when photographing white/ light objects in very bright light, but I think slight under-exposure would help maintain that detail. Rated 5 out of 5 by Anonymous from Best 35mm landscape film For people who still shoot 35mm BW film. This is it. Landscapes in a Hasselblad X-Pan show no grain at 16x 20. And the tonal range is great. Responds well to all the BW film developers. It is the best low ISO BW film made. Rated 5 out of 5 by Anonymous from One of the best Short of the discontinued Efke 25 and the difficult-to-process Adox CMS 20, this is the highest resolution black-and-white film on the market. I purchased both 35mm and 120 from B&H; I've already shot some of the 35mm and it looks excellent. Be careful with filters though, as this is a contrasty film right out of the box, so you may not want to use deep reds in daylight. Film, the original RAW file. Rated 5 out of 5 by Lirdoing from The Best I've been useing this brand for years - no trouble developing, great contrast and tones and very durable - worked for me perfectly fine two years after experation date. If the week is looking sunny - 50 ISO for me! Rated 4 out of 5 by Anonymous from Very Fine Film As for Black and white films this is definitely at the top of my list. I love the gray tones it can produce and the contrast (Although not as contrasty as the Agfa APX 100 which i also like a lot, and miss). This is definitely a film to keep with you when you travel, especially for outdoor shots, hope to try it on some portrait shots one day...look forward to that. Give it a try you'll find its a great B&W film. One of the meany great Ilford B&W films. Rated 5 out of 5 by Anonymous from Slow, but worth it. Great detail and lots of contrast. Good for landscapes and architectural shots. A poor film for flattering portraits--it will show every wrinkle and pore. How do I empty the Cart? One easy way is to reduce the quantity count to zero. Does this film work in normal lighting or extreme lighting? As a 50 iso ( slower, less sensitive to light) film it requires a fair amount of light. If you're used to shooting 400 speed film like HP5+, you'll also likely notice this film has more contrast. No way... This is a standard B&amp;W film. Best developer to use is Rodinol 1/32 at 8.5 minutes. This is definitely NOT a C-41 film.